As you get closer to your due date, you may be asked to consider an induction. Are you considering induction? Inducing labor is common—but experts agree that unless it’s for a medical reason, induction is risky and best avoided. 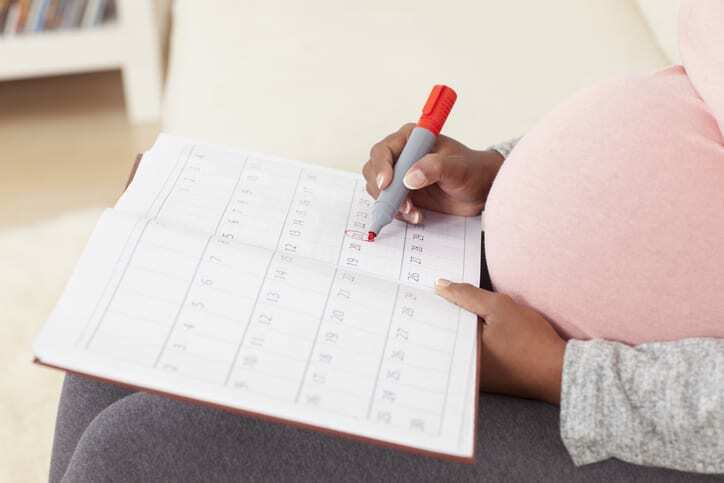 In recent years there has been a movement to wait to induce labor without medical reasons until at least the 39th week—which is 1 week before your due date. But most women won’t go into labor on their own until their due date or a week or so after, and there are many advantages for both women and babies of waiting until your body signals everything is ready by naturally starting labor. Induction increases your risk for cesarean, especially if your body isn’t ready to labor (see “Learn the Bishop’s Score”). Your healthcare provider may recommend inducing labor if you or your baby are experiencing medical problems, such as preeclampsia or poor fetal growth, in which case it’s riskier for pregnancy to continue than for baby to be born early. If your provider is recommending an induction, ask why. Some reasons, such as the baby is “too big,” may not indicate an urgent need for baby to be born. Deciding to induce labor without a medical reason is an “elective” induction. Reasons for elective inductions include choosing to induce labor for either your or your provider’s convenience. Examples might be scheduling induction when your mom is in town or when your provider is on call. Elective inductions bring short-term and life-long risks for you and your baby. Experts agree that an elective induction should never occur before 39 weeks because your due date is just an estimate. 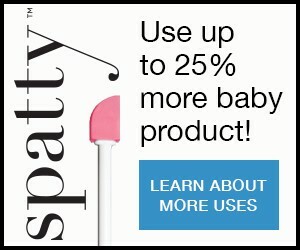 Inducing before 39 weeks could put baby at risk for problems of being born early (premature). But even after 39 weeks, if your body isn’t ready for labor, you still have an increased risk for a cesarean when labor is induced. Women who undergo induction lose the benefits of their body’s natural hormones preparing them and their baby for labor. These hormones start labor when both you and your baby are completely ready and help you have a labor that usually goes faster, with gentler contractions for your baby, than when labor is induced with synthetic hormones. When considering induction, remember: This is your body, your baby and your future. Making sure you know the reason for this recommendation means you can truly make a decision, and not just agree to what could be a life-changing choice. Your body will begin to prepare for labor and your healthcare provider can use a scoring system to assess your readiness for labor as well as how successful an induction could be if medically needed. 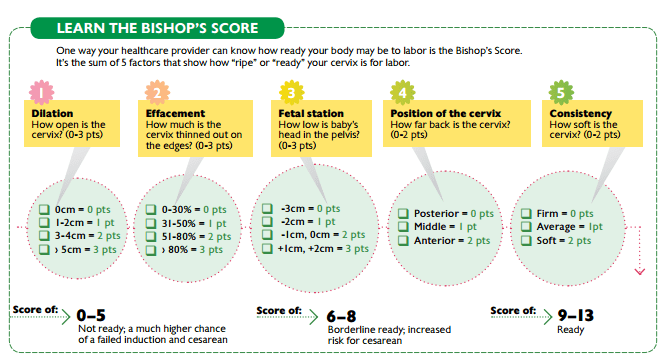 Known as the Bishop’s Score (see below), your Labor Readiness Score is a number between 0 and 13. The higher the number (9 or more) the more ready your body is for spontaneous labor. The lower the number (5 or less), the less ready your body is for laboring, and trying to induce labor could put you at risk for cesarean and other complications. Ask your healthcare provider what your Labor Readiness Score is as a part of making decisions about inductions. Do you routinely recommend scheduled inductions when all is healthy? If so, how close to my due date? What are the medical reasons you might recommend induction, and why? What are my alternatives to induction? What are the risks of inductions? What are the benefits and risks of waiting for spontaneous labor? How will we resolve conflict if you advise an induction and I want to wait for labor to start on its own?